Casey Camp is an artist, writer, and all-around fine gentleman. He loves to work at the intersection of poetry and visual art, typically within the bounds of sequential narrative art. Some people would just call this “comics.” When not crafting art, he can typically be found getting his fix in any matter of competition that he can find nearby. No contest is too big or too small. He lives near Atlanta, Georgia with his wonderful wife, Emily, and daughter, Lennon. 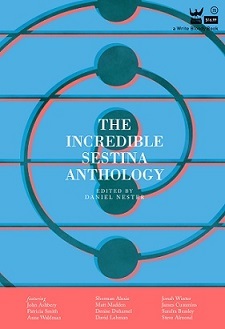 We went Behind the Sestina with Camp to talk about his poem, “A Poem on the Severe Awesomeness of John Zorn,” featured in The Incredible Sestina Anthology. I first discovered it while doing some research. I was working on translating some longer-form poems to comic form and I wanted to do something where I wrote the poem instead of finding one. I wanted it to be interesting on a structural level to see how it translated to sequential panels. After looking around online I found sestinas and that was that. It was too interesting of a format to say no to. I wrote a few before this one just to get a feel for how it works. 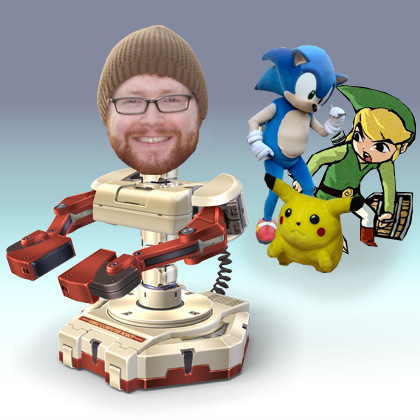 They weren’t anything great, but I made plenty of mistakes and eventually figured some things out. Since then I’ve done some bigger comic sestinas that were set into an installation-type art piece. They were kind of meta-sestinas, if there is such a thing. Bigger pieces with shelves that held sestinas on them which, overall, created a larger pseudo-sestina. Once I get into a form, it’s hard to let go. They started showing up almost inadvertently in my art, even things that weren’t supposed to be poems. 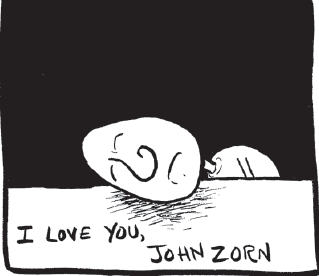 “A Poem on the Severe Awesomeness of John Zorn” is a comics sestina. Can you tell us a bit about putting this graphic poem together? Usually, these sort of things would start out with the poem first, or even me coming up with a few lines of a poem, then going from there. This one, however, happened to start with a doodle before anything else. I had been playing around with putting a graphic poem together using visual cues as the last word of the lines (meaning it would have no words) and wanted to use a little figure. Well, after a little drawing this figure wound up with a clarinet. The words just kind of naturally came out after I’d figured out the big picture. Putting it together was different just because on some pages I’d have an idea for a few panels, but the wording structure is so specific that on a very local level while working on a page the words are already set, so sometimes the challenge was to arrange the panels in a way that progressed the story how it was moving while still maintaining the flow and structure of the poem. It sounds like a challenge, but it’s the most fun kind you can imagine. Like I’d said earlier, I was really enamored with the form. It has a lot of repetition, so I feel like once you have a general idea the next logical place to go would be to figure out what words you will be repeating since they’re such an important part of the piece. In this case you can definitely say that the form impacted what I was going to do – I specifically wanted to write a sestina and specifically one about John Zorn. In terms of the specifics of writing this I was already listening to Naked City, one of Zorn’s bands. For the entire duration of it’s creation I listened to different Zorn albums (specifically his solo work Chimeras, Cobra by Cobra, and several different Masada albums) and I’m not entirely sure what kind of influence they had on the final piece In terms of creation, after the initial idea, the poem was written with the words and art being made one page at a time. Basically I would do the words and a sketch for each panel, then finish the page before moving to the next. I’d be willing to bet that as the piece progresses I was listening to heavier and noisier music of his which is what gives his figure this transformation from a timid kind of fellow to some sort of evil world conqueror. Where did you first hear of Zorn? Why do you think he’s awesome? I had a space in an art studio and there was a communal CD player that everyone just had stacks of CDs sitting next to. A friend of mine at the studio brought in the Naked City album and got me to listen to it, saying it was some crazy experimental super group and it had the Batman theme song. I had listened to Bill Frisell a good bit during college, so that’s how he convinced me to give it a whirl. From then on I was hooked and started checking out a lot of the different people in the band to see what kind of music they made. Once I started the John Zorn rabbit hole, nothing was ever the same. The first sestinas were always dedicated to someone—who would you dedicate your sestina to? Would it be Zorn? I feel like it would be in bad taste to dedicate it to anyone else! I do not know Mr. Zorn, but I guess it’s okay to dedicate a poem to someone you’ve never met. Especially when it’s someone so … awesome?! I mean, those people bowing down at him in the end … that’s not exaggeration. I just want to be on his good side so that when he takes over the world maybe I can be like 123rd in command or something. This entry was posted in Behind the Sestina and tagged a poem on the severe awesomeness of john zorn, art, Arts, Atlanta, Behind the Sestina, casey camp, comic, Forms, graphic novel, Incredible Sestina Anthology, Jessica Furiani, john zorn, naked city, Poetry, Sestina, The Incredible Sestina Anthology. Bookmark the permalink.